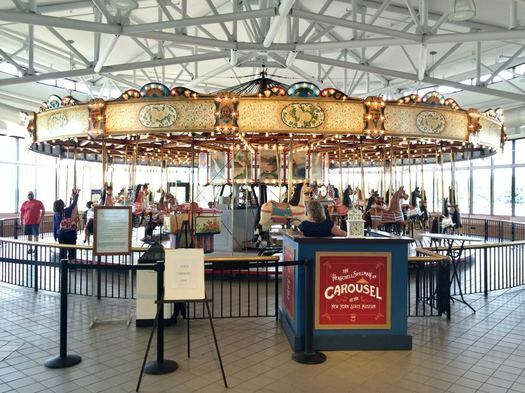 Back in 2001, Ann Winnicki was working in the State Museum's gift shop when her boss came to her with an unusual question: What would she think about being a carousel operator? "And I said, 'There's no carousel here.' And he said there's going to be one on the fourth floor." The State Museum had a circa 1915 carousel in storage and it was preparing to install it on the mezzanine level. Ann remembered seeing all the carousel's horses lined up in the gallery, waiting for their place on the circular platform. "I watched them build it." Since then, the carousel has spun for hundreds of thousands of people. Winnicki has been pushing the button to start many of those rides. But this Thursday she'll push the button for the last time. She's retiring. "I don't normally cry," she said this week, misting up. "It's very emotional." Ann with a few of her regulars. You know how kids just seem to respond to certain people? Spend a few minutes with Ann and you get the sense she's one of them. There's a calm warmth and openness about her, like she's a friend even though you've just met. Before her time at the State Museum, Ann worked as a teacher's assistant for the school district in East Greenbush. 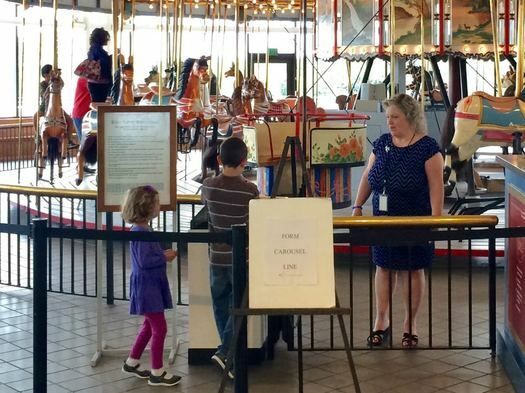 And she got the offer to become the carousel operator because her boss saw how she interacted with children. Over the years at the museum she's also delivered Discovery Place talks and led Rain or Shine It's Reading Time sessions. "I'll miss the kids," she said as we stood watching the carousel. But she's 62 now. She has four grown children, and ten grandchildren. And her sister, just a few years older, died earlier this year. She has things she wants to do, and as she noted, who knows how long she'll have to do them. So it was time to retire. 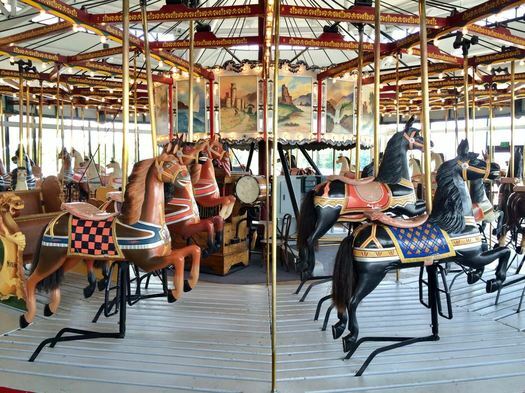 She leaves with all sorts of stories from her time operating the carousel. 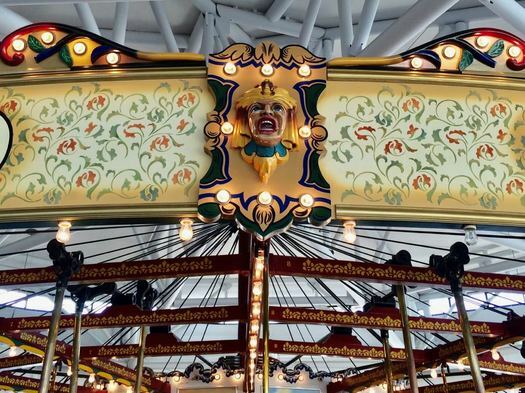 There was the little boy who'd sprint up to the platform in excitement -- then not want to get on because he was afraid of the carved wooden faces that ring the top of the carousel. "We'd tell him, 'Close your eyes,' and he'd get on the carousel." The parents who'd bring in their newborn babies for their first ride. Ann said they got so many people bringing their kids in for their first go-around that the museum made up certificates. All the kids she's watched grow up as they stopped by year after year to take a spin. The elderly couple that would regularly come in to ride the carousel, holding hands. The politicians and officials who'd make their way over from the Capitol for a ride. "I think it takes them back to when they were kids," she said, reflecting on why people seem so drawn to the machine. "You see them coming down and it looks like they're sad, and they get on the carousel and all of sudden they're smiling. They look off into the distance and you can tell memories are going through their mind." 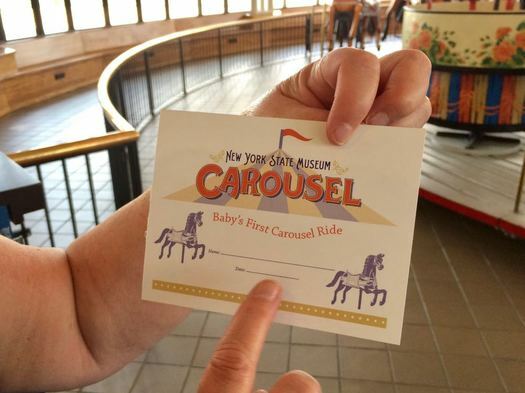 There's a donation box by the carousel, but as Ann notes: "The ride is free. All it costs is a smile." After her last shift, she said it's probably going to be a while before she can come back and visit the carousel. "I leave here at 12 o'clock tomorrow and that's the end of it," she said, tears gathering in her eyes. "And I'll never push that button again. It's a little sad. It's meant a lot. Just seeing people happy, kids laughing." Her farewell messages to the thousands and thousands of kids and adults who've gone for a ride over the years: "Thank you for all the smiles, all the waves. It's been a pleasure working here." Ann might be the nicest, kindest and sweetest person I know! Is she retiring or are they removing the carousel? Thank you for this interview and story, AOA. And best wishes in your retirement, Ann. Thank you! @Tim: Retiring. The carousel will still be there. Who's going to push the button now? I remember when my mom got that job. 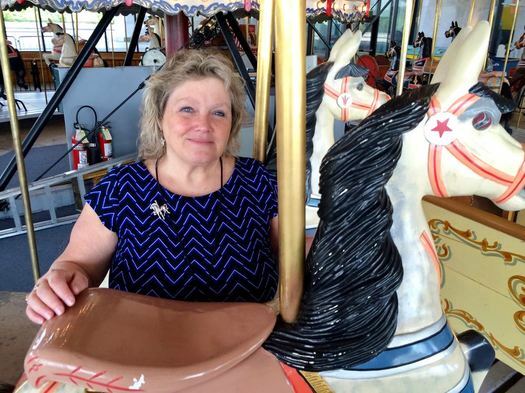 She was so proud of the carousel and the rich history it had. It was something she held very dear to her heart. The most memorable time I had with her with it was last year getting my grandfather to ride the carousel. Watching him on it was like watching a kid. He loved it! Thank you Mom. We love you! !